Love.com.my was launched in the early days of year 2004. With many years ahead to foresee the beauty of an ugly duckling, it is a brainchild of youthful venture, a seed waiting to sprout the first leaf, a droplet waiting to witness the ripple effect. With a smorgasbord of ideas waiting to be served on this website, the first in line is the flowers for the coming Valentine’s Day. Each one of its flower bouquets represents the identity of people living in Klang Valley – hip yet elegant, understated yet attractive. In addition, they are also made affordable to let the loved ones to experience the joy that flowers bring. Shipping charges: Malaysia: Delivery surcharges may apply for states outside of Kuala Lumpur and Selangor. A small surcharge may be imposed on certain Klang Valley areas beyond 20km from KL City Center and this will be computed automatically once you submit the order. Shipping period: Malaysia: If you buy before 3pm, your flowers will be delivered to the designated address on the same day. However, if you place your order past 3pm in the afternoon, your flower will be delivered the following working day. Has this site hosted malware (checked on 27/10/12): No, this site has not hosted malicious software over the past 90 days. If you have any shopping experience with this online store, please leave your comment below. Thanks. This is absolutely disgusting. I paid 50 RM extra as handling fees to deliver at midnight, but they delivered it at 11:15 instead. I have no complaints regarding the quality of products, as I ordered 3 products and each of them is good and as expected. However, delivery was done 45 minutes in advance and the birthday didn’t even start, thus ruining the birthday surprise. If i wanted to get it delivered before time or even after midnight then there was no need for me to pay them 50 RM extra. It was a bad experience for me, first of all, the cute whale add on was a red color fish instead of a blue one, and i was not notified at the first place. Secondly, the flower bouquet that delivered has that Lily that was not open? Lastly, the delivery guy didn’t make a phone call to the recipient before delivery as requested, he just left the flower on the recipient and walk away. I am truly disappointed with your service and i will definitely not going to recommend this shop to any of my friends. The worst Online Florist services I have used, they over promise and under deliver…I ordered with them twice and was severely dissapointed with their delivery and customer service. Both my orders were for my anniversary and today, Valentine’s Day , both the time they failed to deliver on time to my husband in his office and called me after office hours on delivery day to inform me that they can’t do the delivery on that day ….. They basically played me out … Both the occasion’s were very important to me but they did not seem to feel that away…UNBELIEVABLE…to the rest who wants to try …please go ahead and find out for yourself..that this is NOT a company you want to engage with! Don’t Ever Order From Them!! Worst Online Florist in town, no joke!! I believe this is not the first time they could not delivery their promises, and they have no intention to fix the problem, they will leave you with chaos situation and go and repeat it to another unlucky customer! If I were you I will not take the risk! This company is an untrustworthy one. Second Chaos – Order do not deliver at ALL!! Don’t expect they will contact u, they just missing in action!! Conclusion, don’t take the risk if you have a choice! There are plenty of online florists that are more trustworthy! Hey guys!! 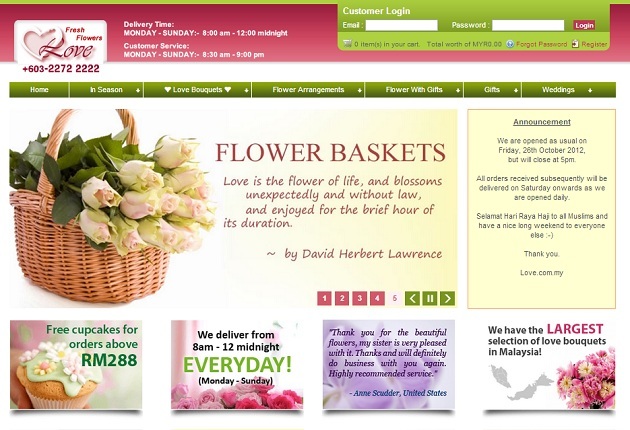 may be you can try for this G-ray florist in malaysia , i have a good experience with them, deliver on time. They never deliver on time and take customer’s money. somebody ran a company check and found out the company is registered under Wong Yee Teng. ONG AI MOI @ WONG ENG (461xx9-08-5xx4) & ANDY KOK SENG ONN (750824-08-5821) Both are from Ipoh, shame on you. Horrible experience. Beware and becareful!!! They change the flowers without informing you for inferior flowers and say they are using an exchange rate of 3.5 but used 3.3; the only reason I found out how hideous the flowers were because my friend sent me a picture and I was horrified! Fast delivery, fresh flowers, helpful customer service. I recommended this service to a friend they like it too. Ordered roses for my partner for valentines day, the delivery driver knocked briefly and then left without delivering. I later received two emails, one saying they had left the deliver with a neighbour and another saying the opposite. my partner and I tried to contact them several time over the next two days with all the emails being totally ignored and only one call answered by the shop indicating they would have to ask their ‘boss’ on what to do. Needless to say, my partner didn’t receive her flowers and I have paid for the inconvenience. I will most certainly not be using this service again! I made an international order. As per the information on the site, they deliver 24/7, with only urgent orders incurring an additional surcharge. My order for the same night within 2-3 hours before 10pm was charged to my card with the calculated charge for the time bracket selected. The flowers were not delivered. The next day, after making an online inquiry, I was contacted by the florist to advise me that only the order booking is 24 hrs, and they only deliver from 8am-5pm. When queried about the time bracket delivery option she ended the call, promising to call back. I later received a second billing of $10 USD to complete the order, outside of my preferred time. This was after sending an email to advise them of my wish to cancel my order, and have my card charge either cancelled or reversed back. In short, the full service provided according to their website appears to largely lies, and they will happily take your money before even thinking of providing the service, and then bill you again just to be dicks. 1. The flowers are of poorer quality and smaller quantity than the details and images on the website. 2. They did not deliver on the actual date ordered. The delivery man just left it at the condo reception. When I messaged the florist to find out why, they lied and said the recipient had told them to. I then had to ask the recipient so I spoilt the birthday surprise and more importantly, she had not been contacted at all. Love florist could not offer proof of contact. 3. Poor and defensive customer service. When I complained, no positive action was taken, just poor excuses. The only good service this company offers is an email reminder when you have a special occasion coming up. But then again, it’s another great opportunity for them to SCAM you!! !